The endless summer beaches and incredible beauty of the Pacific Coast await you at Pine Acres Lodge Monterey Pacific Grove. One bedroom “Cottage” condos sleep up to four comfortably in a queen bed (in the bedroom), and either a queen Murphy (most units) or full sofabed in the living area. There is one bathroom with tub/shower, dining area, and a full kitchen. Units measure about 600 square feet. Some units have a deck or patio. The resort boasts that all condos were fully renovated in 2010, with all new furniture and kitchen appliances, plus a flat panel TV and DVD player in the living area. Perfect location near Monterey and very close to the beach. We rarely get Pine Acres Lodge condos, so we recommend what we think is a far superior resort, Worldmark Marina Dunes at Sanctuary Beach, located in the Marina/Monterey area. Please click here for more information or to check availability at that resort. Check our great rate of $899 including tax and cleaning, versus the regular resort rate of $1232 for the week. See photos and information about the studio here. Enjoy a leisurely, California-style vacation this year at Pine Acres Lodge Monterey Pacific Grove. 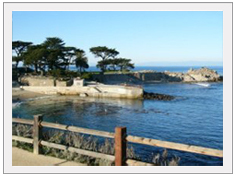 Pacific Grove adjoins Monterey and is the starting point of the spectacular 17-mile drive to Carmel. Seven golf courses can be found within a 10-mile radius of the resort. Two blocks from the resort, set off on a walk along the stunning coastline. Also close by, you’ll have access to deep-sea fishing, hiking, horseback riding, and tennis. At the resort, relax and unwind in the sauna and Jacuzzi. Don’r forget, Pacific Grove is famous for monarch butterflies — so visit the “butterfly trees” — pine trees where migrating monarch butterflies roost from October to March. Pine Acres Lodge is a great choice for a tranquil yet active vacation holiday. Celebrate with friends and family in the picnic and barbecue area, or jump in and let your cares drift away in the Jacuzzi at sunset or under the dark night sky. Other amenities include an onsite laundry facility, free WiFi internet, and movie rentals.